The Missile Defence Agreement between the U.S. and Poland was signed on 20 August 2008 by former U.S. Secretary of State Condoleezza Rice and Polish Foreign Minister Radosław Sikorski. The agreement had taken almost two years to negotiate. Prime Minister Donald Tusk had been sceptical about the plan from the start and the majority of Poles were opposed to it. But in the immediate aftermath of Russia’s invasion of Georgia in early August 2008, Tusk’s government finally agreed to the Bush Administration’s terms and the agreement was signed. Within the agreement were plans to deploy 10 interceptor missiles in Poland to be guided by a radar system based in the Czech Republic. Poland was also promised other strategic support to coincide with the shield, such as Patriot missiles and other military equipment and training. Although both U.S. and Polish officials signed the agreement, it did not become a binding international treaty, as neither the U.S. Congress nor the Polish Sejm had ratified it. Despite the extremely inopportune timing of the Obama Administration’s announcement, the U.S. government justified the decision by stating that new intelligence suggests that Iran is not developing the kind of long-range offensive missiles the Bush shield was designed to protect against. The Bush Administration had championed the missile defence system based strictly on the premise that it would be a strategic deterrent against long-range rogue missiles fired from Iran towards Europe or the U.S. Mr. Obama said in a press conference on the 17th that the U.S. will now alternately focus on developing a less costly, less controversial system to defend against Iran’s short- and medium-range missiles. Defence Secretary Robert Gates added in a separate press conference the same day that the new proposed system could be operational six or seven years before the Bush-era shield would have been ready, thus more effectively replying to future threats. Critics of Obama’s decision at home and abroad claimed that it was a blatant concession to Moscow and it will empower Russia to re-exert itself in Eastern Europe. Putin was quick to respond to the news and said that the decision was “correct and brave”. Attempting to deflect accusations of appeasement, Obama stated that he had repeatedly made clear to Russia that its objections to the Bush missile defence program had been “entirely unfounded”. After all, the missile shield in Poland never had anything to do with Russia, right? Politics and controversy aside, what will the American decision actually mean for U.S.-Polish relations and the balance of power in the region? It certainly indicates a major shift in Obama’s strategy in Poland and Europe compared with his predecessor. Poland was among the first countries to pledge troop support and was part of the four-member Coalition of the Willing that took part in the March 2003 Invasion of Iraq*. Since many of the U.S.’s traditional allies in Western Europe condemned the war, the Bush administration sought to make an ideological distinction between those who were “with us” and “against us”, and thus Donald Rumsfeld coined the terms New Europe (largely Central and Eastern European countries) and Old Europe (most notably France and Germany). Obama has already taken steps to patch up U.S.-EU relations, which suffered greatly under the Bush Administration. While the days of Poland’s “special” status (whatever that did or didn’t mean) in Washington appear to be over, this doesn’t by any means indicate the end of U.S.-Polish cooperation with respect to strategic regional security. Obama and Gates both stated in their respective press conferences on 17 September that in the second phase of their new plan the U.S. will add a modified version of SM-3 land-based missile interceptors, which are still being developed and will not be in place till 2015. They said that both the Czech Republic and Poland are viable sites for these interceptors. Again, many detractors easily shrugged this off as lip service, but after the dust had settled a week later the Polish government actually welcomed the development. “If this system becomes reality […] it would actually be better for us than the original missile shield program,” said advisor to PM Donald Tusk, Sławomir Nowak, on 24 September. What is certain now is that with the dissolution of the missile defence shield, a new era has begun in American-Euro-Russian relations. The original missile shield’s biggest detractors pointed out that since it was a purely U.S.-Polish bilateral initiative, it undercut NATO’s strategic plans while excluding and therefore threatening Russia. 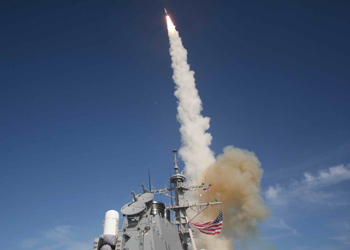 NATO’s new secretary general, Denmark’s Anders Fogh Rasmussen, said, “NATO should now explore the potential for linking the missile defence systems of the United States, NATO and Russia. A first step should be to revitalize the NATO-Russia Council.” Cooperating with Russia might not be the first thing on most Poles’ minds right now, but perhaps it is preferable to pointing missiles in their general direction and hoping for the best. Poland’s location places it in the crosshairs of converging forces and in the short term the country has an opportunity to emerge as a leader in a resurgent NATO, if it so chooses. * In the 2004 U.S. presidential debate John Kerry said that initially the invasion force was only made up of the U.S., UK and Australia, and George Bush notoriously retorted that he had forgotten Poland.